The ISA preamp range has graced professional recording facilities the world over - but this classy single-channel model is within reach of the home and project studio. 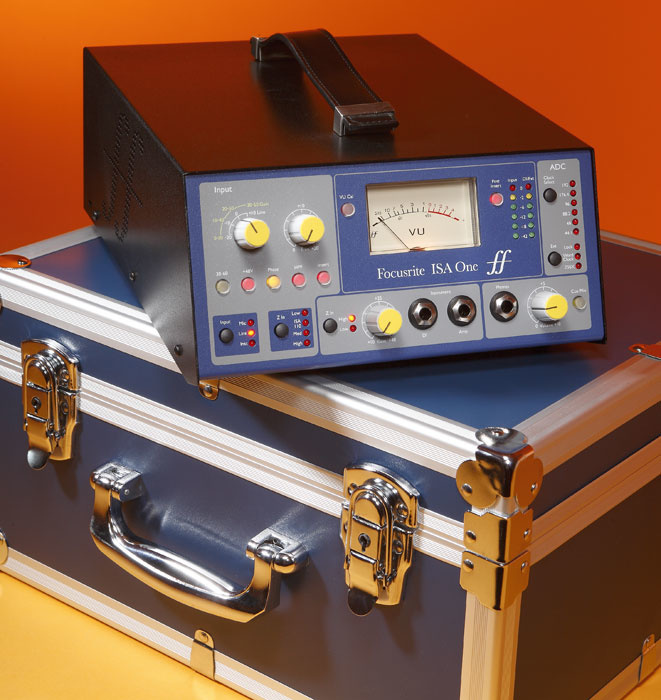 The ISA preamp design, which has long been one of the jewels in the Focusrite crown, can be traced back to the original Rupert Neve circuit developed for the ISA 110 module. The design was commissioned for the famous AIR studios and combined a transformer-coupled mic/line preamp with a classic Neve equaliser. So successful was the ISA 110 circuit that it was to provide the basis for the Focusrite Forte Studio Console, and more recently it was re-engineered as a single-channel 1U rackmount device. Today, the pro studio market continues to shrink while the private studio market goes on expanding, leaving companies like Focusrite with the challenge of creating high-end products that are within the budget of a typical project studio owner. The company already manufactures the Platinum series of processors for those who need something quite cost-effective, but it would be madness to try to build a Platinum version of an ISA unit — the component cost alone would render it impossible. A more practical answer is to break the high-end products down into separate blocks, and that's the approach taken in the ISA One. The ISA One gives you a single channel of ISA 110 preamp built into a desktop unit. It also provides enhanced DI facilities, but doesn't give you the EQ. It isn't exactly cheap, but it is far more affordable than you might expect for a product of this pedigree — and its credentials are beyond dispute, as the design is faithful to the original circuit topology, using the same Lundahl L1538 transformer and Zobel phase-correction network on the input. A 24-bit, 192kHz digital output card is also available (the same one that's used with the ISA430 Mk II, with a dynamic range of around 119dB), but again, to keep costs down, you don't have to pay for this if you don't need it. The new case design has a sloping front panel but the panel layout and distinctive colour scheme are pure Focusrite. The majority of connections are on the rear panel, although the DI inputs and the headphone output are on the front panel for ease of access. The ISA One comes in its own small flightcase, which makes it ideal for the engineer/producer on the move. As you'd expect, the preamp has both balanced XLR and balanced jack inputs to accept mic or line-level signals. The DI channel has its own gain control, a switch to match impedance for active or passive guitar pickups (470kΩ or 2.4MΩ), an unbalanced input jack and an unbalanced 'link' jack output, which can be used to route the DI signal to a guitar amplifier. 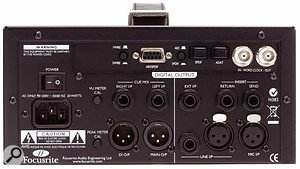 The DI also has a separate balanced XLR output on the back panel. However, the main channel source may also be set to Instrument, which feeds the DI input through the main channel so that it can take advantage of the transformer signal path and the insert points, if required. When Mic or Line is selected, the main channel and DI channel function independently, allowing both to be used at the same time to feed separate DAW inputs. When the ISA110 was designed, there wasn't the current fascination with switchable mic-amp impedance settings, so to appeal to today's user, Focusrite have included a 'Z In' button that steps around four different impedance options: Low, Med, High, and the original ISA110 setting (the actual impedance values are 600Ω, 1.4kΩ (ISA), 2.4kΩ and 6.8kΩ). A similar 'press and step' button selects Mic, Line or Instrument as the main channel input source. An insert point in the signal path allows additional processing, such as a compressor or EQ, to be inserted into the signal path, and in addition to the expected switchable phantom power there are buttons for phase reverse, a 75Hz, 18dB/octave high-pass filter and a selector that sets the gain range to either 0-30dB or 30-60dB. When the line input is selected, the gain range is restricted to 0-30dB, and when the 'Inst' input is selected, the gain knob in the DI section controls the level. Four coarse gain settings are available via the leftmost knob, and the knob directly to its right functions as a gain trim control with a 20dB range. Although the front panel is dominated by a large moving-coil VU meter (with variable calibration for matching to both analogue and digital recording levels), there are two further six-section peak-reading LED meters to the right, which can be used to meter the mic/line and DI levels, and there's a switch for pre- or post-insert monitoring (the insert can also be bypassed). According to Focusrite, the default meter calibration has been set to match the reference points used in Digidesign's Pro Tools HD DAW. A further row of LEDs to the extreme right of the unit show the current sample rate and sync status (when the optional digital card is fitted), as selected by a pair of step switches. Sample rates can be set at all the standard values from 44.1kHz to 192kHz, and the sync options when running from an external source are word clock and Digidesign's 256x clock. A Lock LED lights solid when the unit is synchronised to an external source. At the bottom right of the front panel is the headphone output, which has its own level control and a Cue Mix button. Cue Mix is a facility that allows an external stereo cue mix to be fed to the headphones via two TRS jack inputs on the rear panel. Depending on the setting of the Cue switch, the ISA One either routes a sum of the two inputs (mic/line and DI) to the headphones output or sends the external cue mix to the phones. One feature that is missing, though, is a means to monitor both the preamp inputs and the cue mix at the same time, with a control to balance the direct and DAW cue levels in the phones output. This feature is offered by a number of other preamps, such as the SPL Channel One, for setting up latency-free source monitoring. Presumably it has been omitted here to keep the price down. On the rear of the ISA One, power comes in via the expected IEC mains connector and rocker power switch. A rotary trimmer allows the main VU meter to be calibrated to suit the user's system, and a similar trimmer can be used to calibrate the peak LED meters. TRS jacks are used for the left and right Cue Mix inputs, and both the main and DI outputs are on balanced XLRs. The front-panel DI signal is always present on the DI output, regardless of the setting of the Inst switch in the main channel. A further 'Ext I/P' TRS jack allows a single input to be connected for monitoring or to pass through the converter on the digital output card (where fitted), but this has no level control, which means that it must be adjusted at source. The main output comes via a balanced XLR connector. The optional A-D card fits easily into the ISA One and adds a range of digital output formats to the analogue ones that are already present on the preamp's rear panel.On the main channel there's another balanced XLR for the mic input, whereas line-level sources can be connected either to a second balanced XLR input or to a balanced TRS jack. On the inserts, the use of TRS jacks for both send and receive allows balanced operation, and because these can be bypassed from the front panel, they can be left permanently connected to an external device or patchbay. A horizontal blanking plate at the top of the rear panel can be removed for fitting the optional two-channel digital converter card. 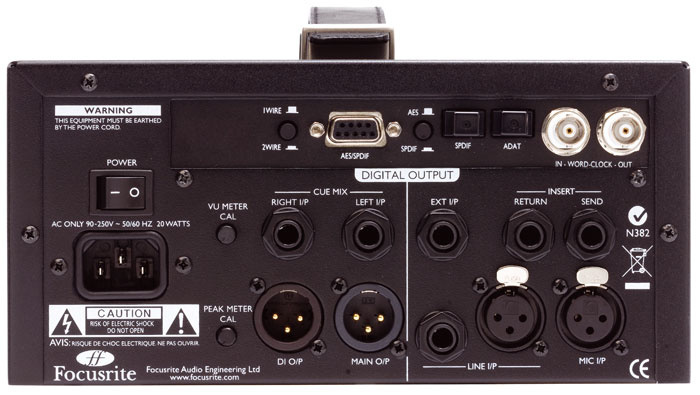 When fitted, this adds a nine-pin D-sub for AES (one- or two-wire mode) or S/PDIF connectivity (selected by a small physical switch), word clock In and Out on BNCs, and a pair of optical outputs carrying ADAT and S/PDIF formats (the ADAT data format restricts the maximum sample rate to 96kHz using S/MUX mode). In normal use, the main and DI channels are output via the two converter channels. Installing the digital card is pretty straightforward: you remove the top cover of the unit, take off the rear-panel blanking plate, mount the card using four screws, plus two more to secure it to the back panel, and then you only need to connect a single ribbon cable to complete the job. Once the unit has been reassembled, you need (for the first time only) to power it up while holding down any of the front-panel switches, to initialise the card. Technically, the ISA One's EIN (Equivalent Input Noise) of -126dB (60dB of gain, 150Ω terminating impedance, 22Hz/22kHz) may look less impressive than some budget mixers — but that is only because it has been measured more honestly, with a typical mic load connected to the input rather than a short circuit! What matters more is how quiet the mic amp is at normal operating levels, not just flat out, and this is one area where more serious mic preamp designs such as this one really score well, due in no small part to the switched gain structure of the front end and the use of an audio transformer. With 30dB of gain the distortion is better than 0.001 percent at 1kHz, while the frequency response at maximum gain is 16Hz to 118kHz (-3dB) and at unity gain extends up to 200kHz. Common Mode Rejection ratio is an impressive 98dB at 1kHz with +24 dBu input, and crosstalk between the channels is negligible. While some preamps are built to sound as transparent as possible, the ISA design has a definite character: it comes over as being natural but is actually quite flattering, and it really helps to push a vocal to the fore without making it sound bright or aggressive. The subjective audio quality of the preamp made itself very obvious when I tried to use the ISA One to replace a section of vocal in a recording that I had made about a week earlier using the preamp in my audio interface (which I'd always thought sounded pretty good). I used the same microphone, in the same setup, with the singer at the same distance, but the ISA One recording sounded far better focused — solid and clear, but in no way harsh or thin. Perhaps the best way to describe the ISA One sound quality is to say that it sounded 'right' and it sounded expensive! I tried the different input-impedance options of the ISA One but nothing sounded close to the original recording, which now seemed somewhat woolly and over-warm by contrast. In fact, it was so obviously different that I had to go back to the original preamp to do the replacement, whereupon the sound matched perfectly. The DI function just gets on with the job in hand, delivering a clean, quiet version of whatever you plug into it. The digital option is very transparent and fuss free: it is difficult to evaluate converters when they get beyond a certain quality level, but I certainly have no problems with this one, and if your audio interface isn't that great on the converter front but has digital inputs, you'll almost certainly get better-sounding results using this card. Being able to route the DI signal via the main channel is also a nice touch, as is being able to monitor a stereo cue feed (such as your DAW output) via the phones. All else considered, I can forgive the lack of cue/direct monitoring with a mix balance control because most DAWs can now work with such low latency during tracking that few performers are put off by it. Once you've sorted out your room acoustics, choice of mic and mic placement, your mic preamp is probably the most important element in determining the level of audio quality you can achieve, so buying one preamp of this quality for your main tracking jobs makes a lot of sense. During my tests I found that even relatively inexpensive studio mics sounded noticeably classier through the ISA One than through a basic budget mic amp — so don't think that because you don't have any high-end mics you don't need a good preamp. The extra DI feature is very welcome, especially as it can be used independently of the main mic preamp (I don't recall anyone else doing this on a preamp of this type), while the various concessions to the 21st century — such as switchable mic impedance, meter calibration to encompass digital levels, and a digital output option — are very welcome. If you're considering the ISA One and want to audition some alternatives, you could look at products such as DAV Electronics' BG9, Universal Audio's Solo 110 and 610, and the Grace Designs 101. Includes separate high-quality instrument DI. No DAW/Direct balance control for latency-free monitoring. An excellent preamp, both on paper and subjectively, that really delivers on quality at an affordable price. ISA One £499.95; A-D card £249.95. Prices include VAT.